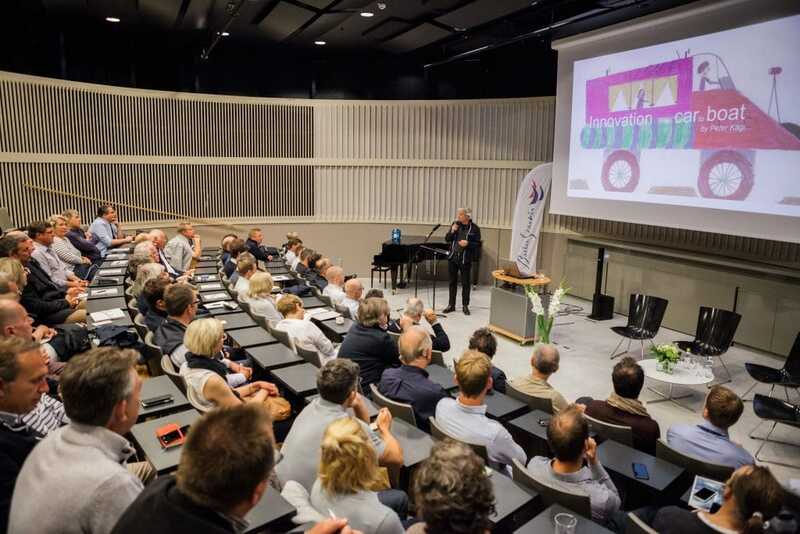 Encouraging innovation, the importance of welcoming experts from outside the company and the need for disruptive thinking were key messages delivered by the renowned forward thinker Alf Rehn and Pink Gin’s owner Professor Hans Georg Näder in the first Baltic Yachts’ Symposium. Alf Rehn emphasised that we must nurture innovation by encouraging creativity in the workforce and by respecting ideas from across the company not just from the perceived ‘bright stars’ at the top of management. The importance of keeping Baltic Yachts’ doors open to people outside the company with great ideas and problem solving ambition was also emphasised. Peter Kägi, the Swiss automotive expert, who has worked with Baltic Yachts on a number of projects, described how his own experience involving the electric car had taught him to never give up with an idea. Mikael Strengell, Baltic Yachts’ technical manager, enlightened the group on exciting new ways of controlling yachts using augmented reality delivered through visors in head up displays. The hot topic of foils on supersailing yachts was outlined by Baltic Yachts’ head of research and development Roland Kasslin, who put cases for and against the new technology. Feedback from the two-day symposium has been used to help move ideas at Baltic Yachts to the next level. “Encouraging people to think disruptively and welcoming those from outside the company with expert knowledge and great ideas will be key drivers to taking Baltic Yachts forward to meet the demands of clients,” said CEO Henry Hawkins. The next Baltic Yachts’ symposium will be held in 2019.